The Dryden Campus offers a wide variety of programs to meet the education and training needs of the Dryden area. Our programs range from full-time postsecondary diploma programs, full-time and part-time certificate programs, continuing education courses, general interest courses and other education training opportunities. 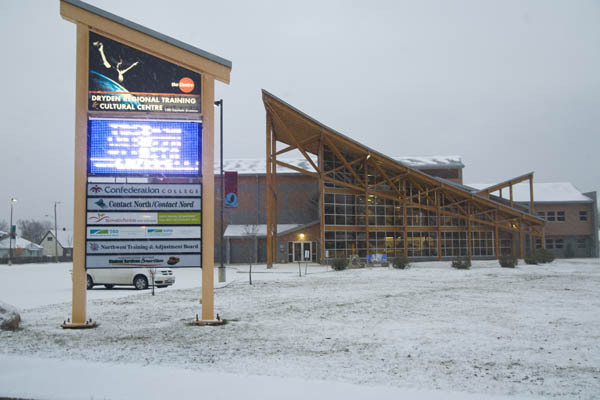 Our Dryden Campus is located in the modern, multipurpose Dryden Regional Training & Cultural Centre. When you enter the front glassed-in atrium and look up, you are greeted by an incredible artistic stained glasswork suspended from the high ceiling using fine wires. The art represents the birth of a butterfly from chrysalis, evolving gradually into finished butterflies at the far end. This symbolism is very appropriate for depicting life, and one’s educational journey. It symbolizes what the centre does for the Dryden community. Also incorporated into the multipurpose facility is a large performing arts theatre/concert hall. Our office hours of operation are 8:30 am to 4:30 pm, Monday through Friday.